Pesto is a deliciously simple sauce, preserved since the middle ages. Traditionally, it is a smooth, thick paste obtained from grinding of garlic, fresh Basil with olive oil and, often, pine nuts and grated cheese. For this truly Royal sauce, there are dozens of ways to use. In the bowl of a food processor or blender grind in pulse mode, pine nuts, garlic and Basil. Gradually add the olive oil, then sprinkle in the Parmesan cheese, mix to a smooth paste and season with salt and pepper. Finished pesto can be stored in the refrigerator for several days, in the freezer, the sauce can be stored up to two months. 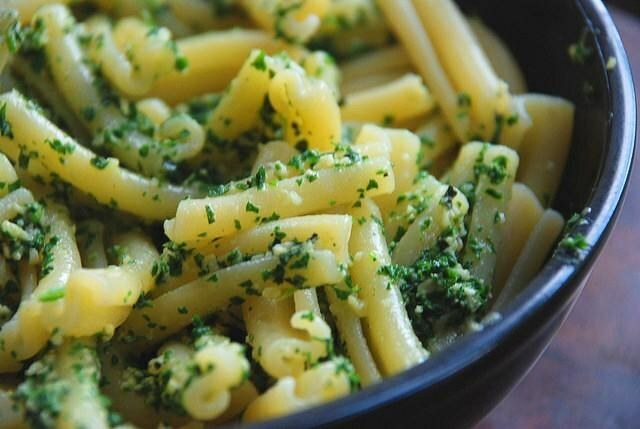 The most common dish with pesto pasta and pizza. The pasta sauce is added at the last moment before serving. To cook pizza with pesto, replace the tomato sauce, which lubricate the pellet before? how to put the filling. Another popular way to use pesto is to put a few spoonfuls into the hot soup ready. The green soup is to add the pesto Genovese, soups with tomato – pesto Rosso. Ideal sauce for soups, soups, seafood, traditional Italian soup, minestrone. If you mix pesto with lots of olive oil, add freshly squeezed juice from citrus or wine, vinegar or soy sauce, will make a fabulous marinade for meat, poultry or fish or a dressing for salads. Pesto is used for cooking him steaks, vegetables, put it in the smoothie. Put a little pesto in the scrambled eggs and the dish is enriched with new flavors. A good way to cook with pesto – simply spread it on bread or a roll instead of butter, and then to build a magnificent sandwich that, if desired, and bake. Also add pesto to the dough for pasta, bread, rolls. With pesto you can eat cold meats, sliced fresh vegetables, bread sticks. The most common mistake to use pesto – excess dosages. Most often a dish for three to four consumers only need one or two teaspoons of sauce. - 1 tablespoon of olive oil. Cut the salmon amuse, it is ideal for cooking a fatty soup or for pickling. Cut the fillet lengthwise in half, then into several pieces along. Brush each slice with pesto, then roll into rolls and secure with toothpicks. Fry the fish in preheated pan oil for 4-7 minutes.